DPT at Market and Main St. Essay and photostream by John Han. I have already received a notice from the Department of Parking and Traffic (DPT) that my letter to contest the first of the two tickets that I received along the Embarcadero has been denied, and that I owe the $90 penalty. Insufficient argument, they say. I now have the option to go to a hearing officer in person and contest that ticket at the DPT office. I will. 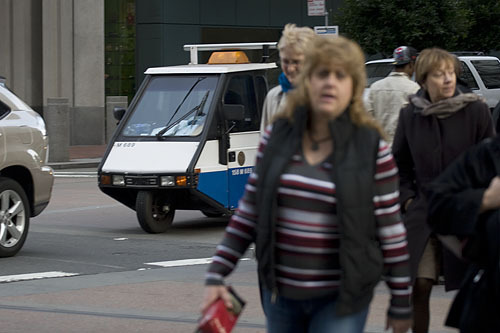 I hope I can get some help from Michael Harris at SFMTA Taxis and Accessible Services Division, and Christiane Hayashi. I could really use a letter of support from the SFMTA, and bring it to the hearing officer to show when I contest. I tried the “except when necessary to avoid conflict with other traffic” in my letter to contest, seeing how this is the Embarcadero... arguably the busiest, most trafficked street in the City. But it seemed the DPT ignored it, and I was still denied. This is the large crosswalk along the Embarcadero in front of the main entrance of the Ferry Building where the blocking crosswalk violation was cited. I was issued a second ticket a week after getting the first one in the same spot along the Embarcadero at the Ferry Building, but this time for blocking the bike lane. You can read all about that second ticket in “Taxi Driver Vs. the DPT Round 1”. This is the overwhelming ticket that’s getting issued along the Embarcadero, according to Yellow Cab, which says it’s gotten slammed with these tickets as of late. I have the evidence showing they’re still trying to issue these tickets out like it’s a miracle cure for the budget crisis. The City is in a budget crunch, and it’s doing whatever it can to anyone to get money out of people. This picture was taken on Market near the corner of 4th St. 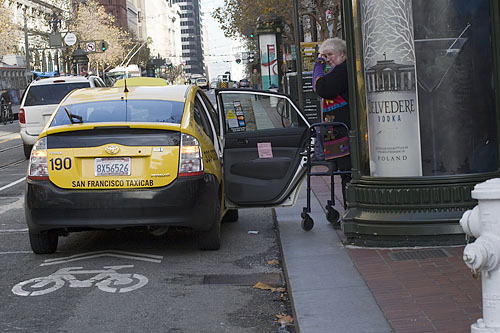 Here, a Yellow Cab is dropping off a senior citizen in a bike lane but she is using a walker. Does this taxi driver appear to be reckless and deserving of a ticket, or is this the kind of honorable service the City would like to see offered to its public... many of whom rely on transportation services like Paratransit? Ferry Plaza. Here is where tickets along the Embarcadero are going out by the DPT like there's a plague. 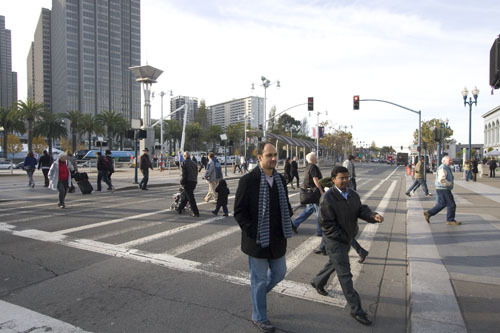 A woman is standing in front of the large crosswalk on the Embarcadero in front of the Ferry Building. If she were to flag a cab, as so many people do here, where could the driver legally pull over? This is one of the main reasons why cab companies have been getting flooded with tickets. 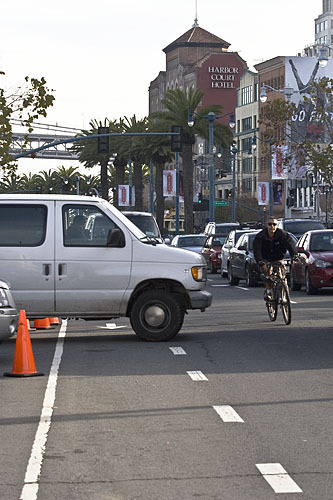 Here, a bicyclist riding along Embarcadero in front of the Ferry Building is pushed out of a blocked bicycle lane. But the vehicle is associated with the Farmers' Market and so is not ticketed. But taxi drivers have been getting ticketed frequently and unfairly here in the same area. 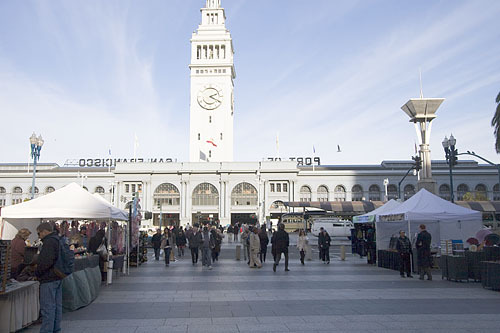 It is a double standard suggesting that the Farmers' Market is good for the Embarcadero... and it is... but that the cab drivers, on the other hand, serve no meaningful function in the same area, and so should be ticketed. Another vehicle associated with the Farmers' Market. It is clearly blocking the bike lane. 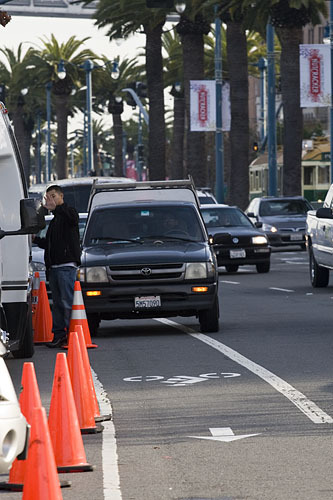 There does not appear to be a provision within VC21211 "Blocking Bike Lane" that allows local governments to allow vehicles associated with farmers markets to be exempt from California's Vehicle Code 21211. Only utility vehicles, newspaper deliveries, garbage trucks, and tow trucks are supposedly exempt from this code. 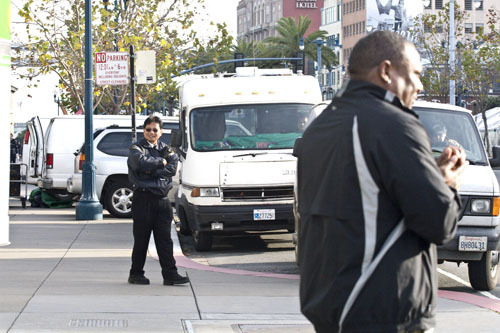 A uniformed DPT person (left) monitors the Farmers Market and the traffic along the Embarcadero in front of the Ferry Building. 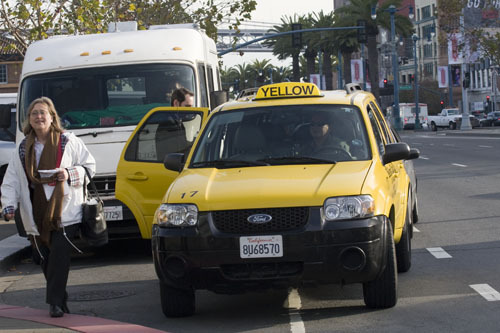 Here's what looks like a South City Yellow Cab dropping off a passenger in front of the Farmers Market. Where else close to the curb can the taxi worker drop off? But who knows if Yellow Cab will get another ticket in the mail for what should be considered good transportation service? Here is a plain clothed DPT person. 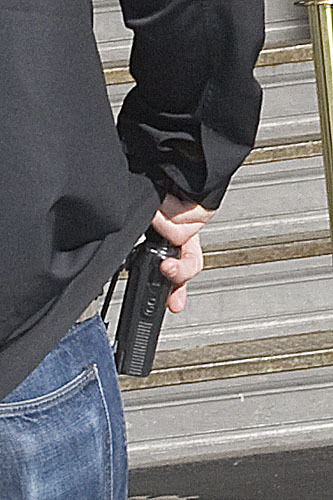 I know this because I was standing in front of him when he was talking into his DPTwalkie-talkie. Two more plain clothed DPT people. This is why taxi drivers have no idea at all that they've been ticketed. There is no communication between the DPT officers and the taxi workers. License plate numbers are simply taken down, and $105 tickets are issued to the cab companies in the mail. I have many pictures of commercial and Govt. vehicles parked illegaly all over town that you know damn well would not get a ticket. I have one of a fedex veh. parked in a red zone in front of MTA HQ. Persoanl cars parked in front of and around 850 Bryant that get a pass cuz they belong to cops of course. We need a friend at MTA like the cops and big corporations have. It's disgusting to take a good part of a days wages from a guy for dropping off for 30 seconds in a bus zone etc. Great pictures. I had no idea that they were using plainclothes types to issue the tickets. I may have one or two myself. This smacks of entrapment. If they really didn't want people to park, they'd make themselves visible. Your right. They want the money. I guess until this is resolved people can walk to the Hyatt to get their cabs. Please contest both tickets and bring the photographs to the instant hearing. Those drivers helping disabled individuals should not be cited. Also, show up at the MTA board meeting on Jan. 4 at 1 p.m. and state your case. This has happened before (unnecessary citing). Political pressure puts a stop to this. taxi malaga airport airport guide with travel and ticket information. ... By taxi. Pre book your door-to-door airport transfers with our transfer partner Holiday Taxis. Some fantastic pictures shared in this post. I have enjoyed spending time on this post. Keep sharing good stuff!